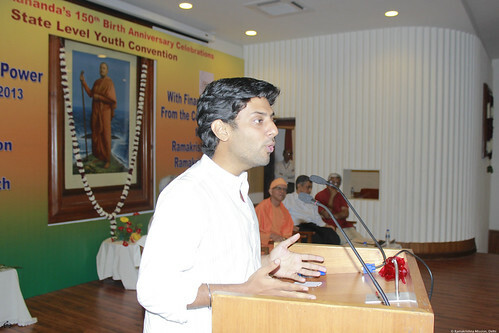 During a session titled ‘Restoring India’s Glory: Role of Youth Leaders (भारतीय गरिमा की पुनः स्थापना – युवा नेताओं की भूमिका)‘ on the third day (20 Oct 2013), Sri Arun Krishnamurthy, Environmentalist, founder of Environment Foundation of India, spoke on ‘Youth and Environment‘. Sri Arun Krishnamurthy quit a promising career at Google to focus on his passion for environment. He now runs Environment Foundation of India (EFI) and Krish Info Media (KIM) that focus on issues of wildlife, conservation and habitat restoration. His team at EFI comprises of some 900 volunteers, recruited through school programmes and street theatre for conservation work. He has received numerous awards for his work, including the Google Social Impact Award, British Council Active Citizen Award and Rolex Award for Enterprise.